When Brentwood Academy meets Montgomery Bell Academy on the gridiron Friday night, BA freshman CJ Sanders’ mom, Stacie Harris, will be watching intently. But she won’t just be glued on CJ’s performance. She’ll also be keeping an eye on the MBA’s home sideline, where CJ’s dad, Chris Sanders, a former Tennessee Titans wideout, will be coaching the Big Red receivers. When Brentwood Academy meets Montgomery Bell Academy on the gridiron Friday night, BA freshman CJ Sanders’ mom, Stacie Harris, will be watching intently. But she won’t just be glued on CJ’s performance. She’ll also be keeping an eye on the MBA’s home sideline, where CJ’s dad, Chris Sanders, a former Tennessee Titans wideout, will be coaching the Big Red receivers. Harris can’t wait to see how Sanders will respond to his son’s play – for the opposing team. Harris and CJ’s dad are divorced but share a common bond when it comes to CJ’s accomplishments. The good-natured ribbing actually “goes back a long way,” Harris said. Chris played football at Ohio State and Harris played basketball at Michigan. As for CJ, his mom said that he’s excited, too. “It is a big thing to play against his dad… and just for his dad to actually be able to see him play football,” Harris said. 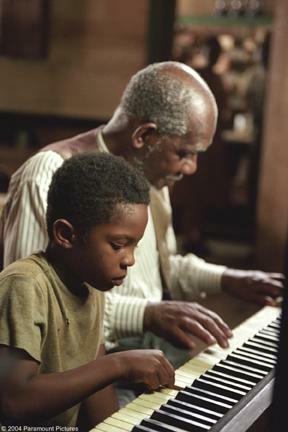 When he was younger, CJ Sanders played the young Ray Charles in the biopic Ray and then appeared in several films and television shows. From 1st through 7th grade, CJ lived with his mom in Los Angeles, and was an actor in such films as the biopic Ray as the young Ray Charles and on the TV show Six Feet Under. Stacie remarried former Vanderbilt and NFL football player Corey Harris, and both decided to move back to Nashville when CJ was 13. After one year at MBA, Stacie Harris wanted to find the high school that was the best “fit” for her son. “(BA) is the one school I went in and didn’t meet the coach. I figured his ability and God would take care of the rest,” Harris said. Based on his early-season performance, she might be right. When several other playmakers went down with injuries, CJ suddenly found himself in a starting role. 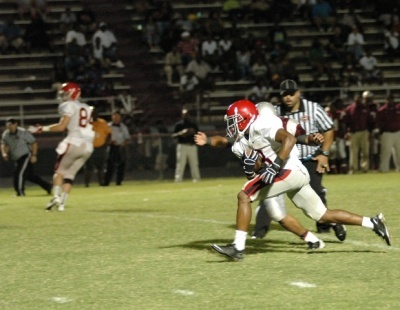 Last week against Maplewood, the freshman exploded for two touchdowns – a 39-yard catch and a 50-yard scoring run. “He’s a really young guy. I’m not sure he knows what he’s doing yet, but he’s got a lot of speed and a lot of talent,” BA head coach Ralph Potter said after the game. On Friday night, Sanders will use that talent and speed to try and hand MBA – and his dad – a conference loss.